Well, spring is here, finally! Lambs are skipping happily around fields, windows and doors opened wide to let some fresh air in after months of cold weather as winter clothes are starting to be packed away for at least the next couple of months. And talking of shiny fresh things, as you might have noticed I spent about a week freshening up the web site. The blog is now integral to the site rather than being hosted by Wordpress so the first few post's have been moved over but I hope you agree they look a whole lot nicer now! I have a few post's planned over the next couple of weeks, one on photographing a photographers wedding. I shot one last year and have another coming up in a few weeks, so please check back in a couple of days! Last summer was quite a busy time with wedding’s, Euro Soccer Championships and the London Olympic’s and Paralympics there was always something going on. Although I didn’t shoot any sport at London 2012, I had quite a bit of PR related work during and after the games. I had shot quite a lot of PR in the run up to the games, everything from the reveal of the Olympic and Paralympic posters to training sessions with swimmers and British taekwondo World No 1 Aaron Cook who didn’t make the games. One of the most incredible races I watched was Richard Whitehead in the T42 200m. He was trailing off the bend almost at the back of the field but raced past the competition in the straight almost as if he’d lit the afterburners to take gold with a world record time of 24.38. The portrait was shot on the day of the closing ceremony for Powerade and it had to be quick, he had a party to go too! I’m finding I’m doing more and more engagement shoots for couples and they are really good fun. I try and do as many as possible outside using the environment thats readily available, only shooting indoors when it turns cold. I find it useful for the couple as they can get used to being photographed and it also shows how quickly I can work. In both the shoots we managed four distinct locations in the same area, both parks, and the entire shoot took less than twenty minutes. I’v chosen a summer and late autumn shoot to show the different times of year. The summer picture of Dave and Emma on the right, was taken in August about six weeks before their big day, they had a picture framed with a large boarder for all their guests to sign. The image of Tiberiu and Aurelia on the left, was taken in late October although with the weather we had last year, it might have looked similar to the sky's we had in June! The really, really good thing about having kids is that, theoretically, you have an on demand model for testing new bits of kit. Of course, the reality is a little different. Can they sand still outside for more than 90 seconds while I do a few tests, well, no they can’t. Its cold, they’re tired, it’s late, there’s something on TV…….you get the drift. However, when they require a lift to a friend’s house at just the time you need to make sure your lens, thats been caught in rain on the last three assignments, is working properly, a compromise can be reached. The image of my son is exactly that, I made sure the lens was working and 3 mins later we were on the road to friend’s house. Happy days! When I was a kid growing up in the seventy’s, sport was what I lived for. Match of the Day on a Saturday night and the Big Match on a Sunday, three first division matches, thats all the football you got on TV then. The biggest star? George Best. Of course, before you were able to get to Match of the Day, you had to endure the ‘Parkinson’ chat show, although occasionally he had guests that were interesting even for an eleven year old. Emu was one I seem to remember but the stand out for me at the time was Muhammad Ali. Did I like boxing? No. Did I watch every Ali fight I could after seeing him on Parky. You bet. Even my Mum watched! 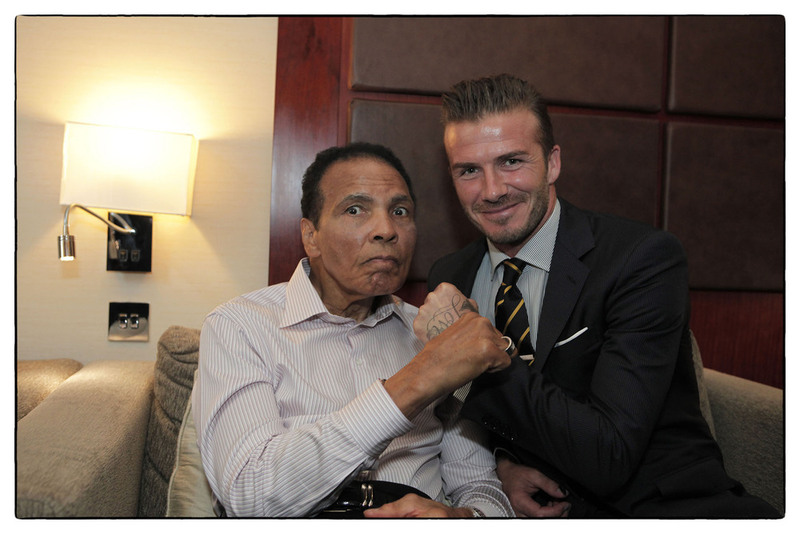 During last summer in the run up to the Olympics, I photographed Ali with one of footballs modern day greats, David Beckham. I’v worked with David before during the FA’s bid to host the 2018 World Cup Finals in England and have also been lucky enough to photographed Royals and Prime Ministers but I can honestly say that when I was told that I would be shooting Ali, I haven’t been as nervous about a shoot since starting in photography. It was a fantastic to meet him and his ‘people’ were great, only having Ali’s interest at heart. It really was an honour, one I’ll always remember.